Inside this magnificent 19th-century building, which was made by famous architect Gioacchino Ersoch, an undisputed master of Roman architecture in his time, there is this stunning luxury apartment for sale in Rome. This estate is on the “piano nobile” of the building and measures over 400 m2. Its rooms are the result of master architect and interior designer Tommaso Ziffer, the historical designer of Valentino stores in Europe, who has wisely and creatively matched a vintage taste with ikat colours and textiles, creating a refined, elegant and unique setting that has a big impact. A sumptuous and richly decorated entrance hall leads to the hall, which has big, spectacular windows overlooking the exterior. There are then a dining room, a relaxation area with a tv room, an en-suite bedroom, a laundry and utility area, and a modern kitchen with steel furnishings, which is accessible from a secondary entrance. On the opposite side of this apartment, there is the sleeping area, with a beautiful oriental-style master suite with panelling, a wardrobe and private bathroom with sauna. There are then two en-suite bedrooms with a big closet area. To complete this stunning property for sale in Rome there are also two convenient parking spaces located inside the communal courtyard. Its refined finishings and advanced domotics system, together with its privileged position half way between 19th-century bourgeois Rome and hectic modern Rome with its luxury shops, make this luxury estate truly unique. Rome is the capital of Italy, has an important history and timeless magic; it is considered the first megalopolis in human history, heart of important ancient civilizations, capital of the Roman Empire and cradle of the Latin language. A varied territory with a diverse natural scenery is one of its main features, but Rome is, first of all, home to an endless variety of monuments that have great artistic and historical value: the ancient Colosseum, the Imperial Forum, the Pantheon, St. Peter's Cathedral, St. John in Lateran and the Capitoline Hill; various historical buildings, luxury villas, charming fountains, lovely piazzas, historic arches, centuries-old bridges and much more. 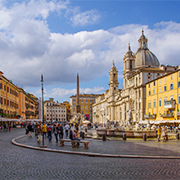 There are many fashionable streets and exclusive areas in Rome, home to dream homes, elegant luxury apartments, and stunning estates of great value. You can find these estates also in Rome's surroundings, on Lazio's green hills or in an exclusive position on the mountains, but just a few kilometres away from Rome and everything that this city can offer. This spectacular apartment for sale is in a stunning building in central Rome, very close to the Vatican. This prestigious luxury apartment for sale is in Rome's exclusive Parioli area. In the heart of Rome, a few minutes from the Spanish Steps, there is this wonderful apartment for sale, located on the first floor of an elegant building.